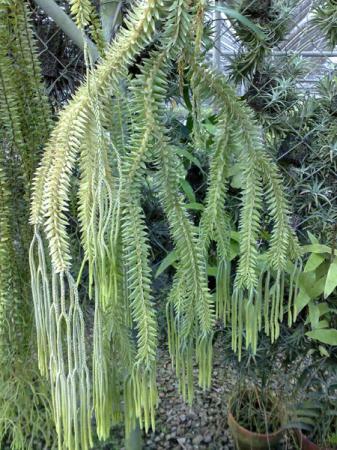 Tropical Tassle Fern (also known as Lycopodium). Not a true fern but a fern relative with pendulous stems and a graceful habit. At the tips of the stems dangle dainty 'tassels' where the spores are produced for reproduction. Rare and hard to find, they are epiphytic so do best mounted and enjoy bright light and medium to high humidity. This is a larger leafed form of the species and has stems about 3/4" in diameter. A bold and striking species. (Note: photo is of a mature plant and does not indicate the size shipped) Available plants are established in co-co fiber in 3" baskets and are 12"+ in length with multiple leads. VERY LIMITED!